Clarets left back Stephen Ward isn’t surprised boss Sean Dyche is coveted elsewhere. Dyche is seemingly linked with every Premier League vacancy at present, having been the subject of speculation surrounding the Leicester City and Everton jobs, and, before it has even come up, West Ham. Dyche celebrates his fifth anniversary in charge at Turf Moor tonight as Burnley host Newcastle United, and Ward is happy to see him stay put, so far. The Republic of Ireland international, who played for Wolves in Dyche’s first game in charge of Burnley, said: “It’d be a blow, of course. It’s no surprise he’s being linked here, there and everywhere given the job he’s done here. ”We can’t think about that. It’s down to the club and the manager himself. If he stays it’ll be great for us. “You’d have to ask him his own opinion. You’ve got players in the squad linked to moves all the time and you think you might lose a certain member of the squad. ”That’s football. Since I’ve been here the gaffer’s been linked with a job every couple of months. Ward is in his fourth season at the club, and, now at the veteran stage after a distinguished career with Wolves, feels he is as fit as he has ever been. Asked if he is worked harder by Dyche than other managers, he smiled: “Erm… yes! Training is up there with the toughest I’ve had. ”I really enjoy it and I’m probably as fit as I’ve felt in my career. ”You never hear anyone moaning about it because you know if you want to play in a Sean Dyche team you have to work hard. “My first session was very hard. It took me about two or three weeks to get used to it. 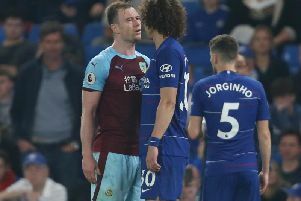 Burnley have won more games away from home so far this season, and Ward is eager to claim another three points against the Magpies: “I still we’ve taken a few points at home. We’ve only lost once. ”Maybe last year we probably looked a bit more on the front foot at home but teams are now coming to Turf Moor and maybe showing us a little bit more respect.